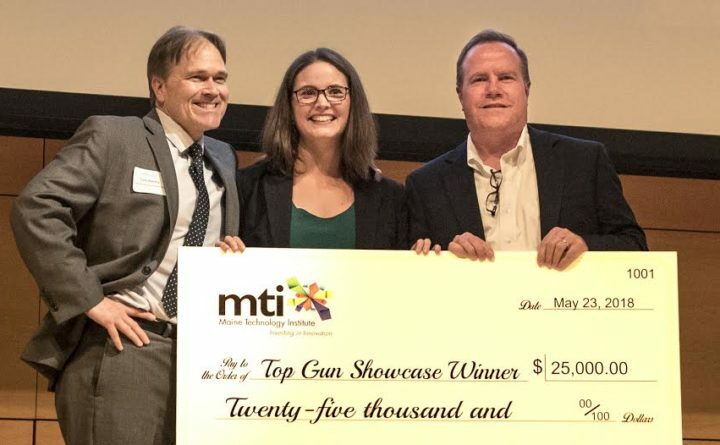 PORTLAND– The Maine Center for Entrepreneurs (MCE), along with its partners, the Gulf of Maine Research Institute, Lewiston/Auburn Metro Chamber and the University of Maine, are pleased to announce the winner of the Top Gun Showcase. The winner of the $25,000 cash prize was Erica Schmitz of MyBodyModel. “What an experience! The Top Gun program helped me connect with an incredible team of mentors that I would not have met otherwise – at least, not within such a concentrated period of time! As a new entrepreneur, to be able to tap into such a wealth of experience and expertise was incredible. And it was so inspiring to connect with my Top Gun peers and alumni of the program, including so many women, who are doing such innovative business in Maine. I’m honored to be part of this program, and I’m excited to continue the relationships that I’ve built through this experience.” Says Schmitz of her Top Gun participation. Eight participants from the Bangor, Brunswick, Lewiston/Auburn and Portland Top Gun classes, representing the first and second place finishers from their respective regional pitch-off events, competed for a $25,000 cash prize sponsored by the Maine Technology Institute. Entrepreneurs presented 5-minute pitches to an audience of 175 enthusiastic supporters and a panel of judges followed by a brief question and answer period. Scoring was based on presentation, innovation, scalability and feasibility. The Maine Center for Entrepreneurs provides the Top Gun Program, an intensive 15-week entrepreneurial training program, as a virtual business incubator for Maine startups. The annual program is designed for competitively selected entrepreneurs that combine mentoring with high-impact weekly gatherings held in Portland, Orono and Brunswick and the Lewiston/Auburn region. Beginning with just a dozen entrepreneurs in Portland in 2009, Top Gun has now helped over 200 entrepreneurs across the state accelerate their businesses. For more information about the Maine Center for Entrepreneurs, please visit:www.mced.biz.